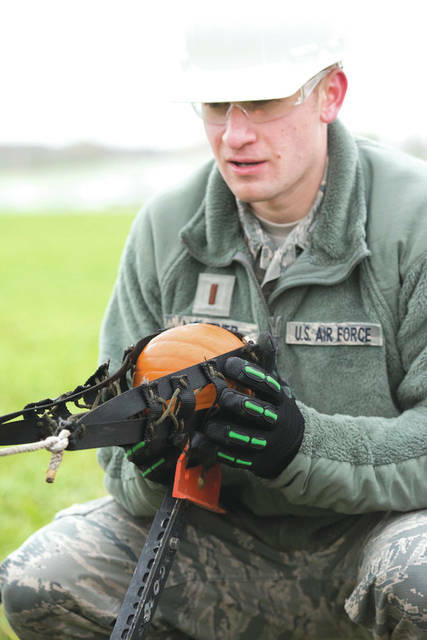 Second Lt. Joshua Lightner, Air Force Life Cycle Management Center’s F-15 Engineering Branch, loads a pumpkin into a trebuchet-style catapult Nov. 2 in preparation for the 14th annual Wright-Patterson Air Force Base, Ohio, pumpkin chuck. The competition, held behind the National Museum of the U.S. Air Force, gave teams the opportunity to show off their engineering skills. 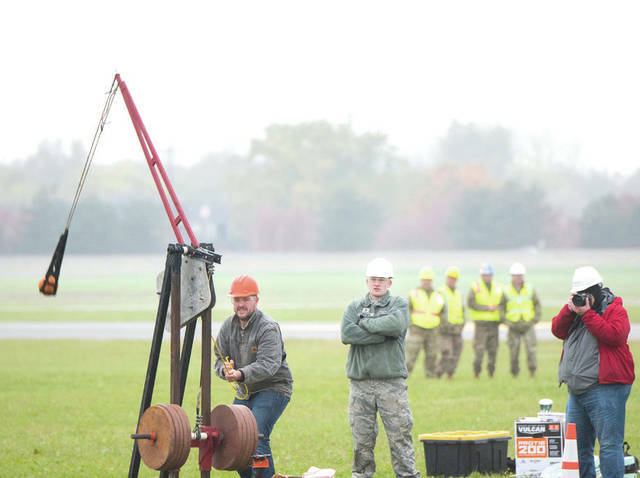 Submitted photos An Air Force Life Cycle Management Center’s F-15 Engineering Branch team member pulls the trigger on their trebuchet-style catapult to hurl a small pumpkin during the 14th annual Wright-Patterson Air Force Base, Ohio, pumpkin chuck Nov. 2. Representatives from the 88th Air Base Wing safety office watch in the background. WRIGHT-PATTERSON AIR FORCE BASE — Cold temps and cloudy skies couldn’t keep guests from enjoying the loud karang of trebuchets launching their loads, and the subsequent satisfying thump of pumpkins returning to Earth at Wright-Patterson’s 14th Annual Pumpkin Chuck in support of Air Force science, technology, engineering and math Nov. 2. “It was super fun,” said Brieanna Baddour, a Girl Scout with Troop 32358 from Beavercreek who participated in the human-powered launcher along with her fellow Scouts. The launcher uses ropes that participants pull on in unison to fling pumpkins several hundred feet. Baddour said she liked the team aspect of it. “(I liked it) because it’s group work and I got to work with my whole troop,” Baddour said. Besides the human-powered machine, Class A and B machines used various mechanical methods to launch orange gourds into the atmosphere at several hundreds of miles per hour. And, if hearing the zing of pumpkins shooting off like bullets wasn’t enough, guests could practice their physics skills on a miniaturized trebuchet, create and launch their own straw rockets, and learn about robotics in a special STEM activity area. “It’s really cold, but it’s still fun,” said Jared Chong, a junior at Troy Christian High School, who competed with his school on a Class B machine. Chong’s not sure what he’ll do after school, but he said he likes engineering because of the visible results, like how far a pumpkin flies. “You have a really tangible way of seeing your progress,” he said. While fun and excitement were keywords of the day, the overall purpose of the Air Force Life Cycle Management Center engineering event was more academic. Flanagan himself was inspired by air shows as a child, which prompted him to first become an aircraft mechanic before realizing that perhaps he could make a difference by actually designing the aircraft. After serving for four years in the Air Force as an A-10 Warthog crew chief, he earned a degree in electrical engineering and has been helping design aircraft at LCMC now for more than a decade. He hopes the event spurs a motivational fire in some of those who came out to watch. Only the future will tell how many young minds were propelled toward STEM at the day’s event, but plans to make Pumpkin Chuck better are already underway. “This was the first year that the Pumpkin Chuck has been a STEM event and we look forward to expanding it in the future with more educational outreach and more school teams competing in the Class B machine,” Flanagan said. https://www.xeniagazette.com/wp-content/uploads/sites/32/2018/11/web1_181102-F-JW079-1057.jpgSecond Lt. Joshua Lightner, Air Force Life Cycle Management Center’s F-15 Engineering Branch, loads a pumpkin into a trebuchet-style catapult Nov. 2 in preparation for the 14th annual Wright-Patterson Air Force Base, Ohio, pumpkin chuck. The competition, held behind the National Museum of the U.S. Air Force, gave teams the opportunity to show off their engineering skills. https://www.xeniagazette.com/wp-content/uploads/sites/32/2018/11/web1_181102-F-JW079-1172.jpgSubmitted photos An Air Force Life Cycle Management Center’s F-15 Engineering Branch team member pulls the trigger on their trebuchet-style catapult to hurl a small pumpkin during the 14th annual Wright-Patterson Air Force Base, Ohio, pumpkin chuck Nov. 2. Representatives from the 88th Air Base Wing safety office watch in the background.